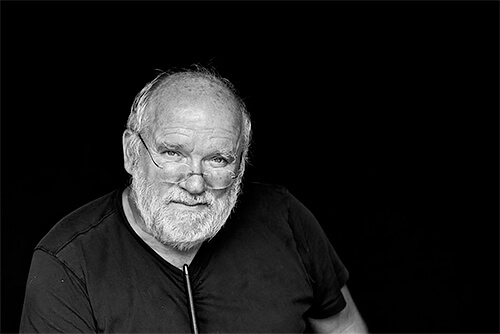 Peter Lindbergh, born Peter Brodbeck, is a German photographer and filmmaker, born on November 23, 1944 in Leszno, Poland (the city was German between 1939 and 1945 and called Reichsgau Wartheland). Peter Lindbergh spent his childhood in Duisburg. After a basic school education he worked as a window dresser for the Karstadt and Horten department stores in Duisburg. At 18, he moved to Switzerland. Eight months later, he went from Lucerne to Berlin and took evening courses at the Academy of Arts. He hitchhiked to Arles in the footsteps of his idol, Vincent van Gogh. After several months in Arles, he continued through to Spain and Morocco, a journey that took him two years. Returning to Germany, he studied Free Painting at the College of Art in Krefeld (North Rhine-Westphalia). In 1969, while still a student, he exhibited his work for the first time at the Galerie Denise René - Hans Mayer. Concept Art marked his last period of interest in art. In 1971 his interest turned toward photography and for two years he worked as the assistant to the Düsseldorf-based photographer, Hans Lux. Peter Lindbergh moved to Paris in 1978 and started working internationally for Vogue, first the Italian, then the English, French, German, and American Vogue, later for The New Yorker, Vanity Fair, Allure, and Rolling Stone. His mostly black-and-white photographs, implement a pictorial language that takes its lead from early German cinema and from the Berlin art scene of the 1920s. In 1988, Anna Wintour arrived at American Vogue and signed Lindbergh for the magazine. He shot Miss Wintour’s first, then revolutionary American Vogue, November 1988 cover. Lindbergh photographed the "iconic" January 1990 Vogue cover that featured Linda Evangelista, Naomi Campbell, Tatjana Patitz, Cindy Crawford, and Christy Turlington. He made portraits of Catherine Deneuve, Mick Jagger, Charlotte Rampling, Nastassja Kinski, Tina Turner, John Travolta, Madonna, Sharon Stone, John Malkovich, and countless others. When Lindbergh was put under contract to the American Harpers Bazaar by Liz Tilberis in 1992, she made her editor sign a seven-figure check. His first book, 10 Women by Peter Lindbergh, a black-and-white portfolio of ten top contemporary models, was published in 1996 and had sold more than 100,000 copies as of 2008. Twice he has shot the Pirelli calendar, in 1996 and 2002. The latter, which featured actresses instead of models for the first time, was shot on the back lot of Universal Studios, and was described by Germaine Greer as "Pirelli's most challenging calendar yet." He currently maintains residences in Paris, Manhattan, and Arles.